Newell at the 2010 Game Developers Conference. Gabe Logan Newell (born November 3, 1962) is an American businessman. He is the co-founder and managing director of video game development and online distribution company Valve Corporation. He co-founded Valve with fellow Microsoft employee Mike Harrington. He is also known for founding online video gaming distributor Steam. Newell was born in Washington. He is married to Lisa Newell (née Mennet) and has two children. He is a financial supporter of the Democratic Party. He suffered from Fuchs' dystrophy, a congenital disease which affects the cornea, but was cured by two cornea transplants in 2006 and 2007. Newell disliked Windows 8, calling it a "catastrophe" and a "threat to PC gaming". Newell's networth is $5.5 billion United States dollars. ↑ Chiang, Oliver (February 9, 2011). "The Master of Online Mayhem". Forbes. Retrieved August 28, 2014. The founder of videogame seller Valve suffers from Fuchs Dystrophy, a congenital disease that slowly destroys the cornea. "I have dead-people eyes", he said at the time. Double cornea transplants in 2006 and 2007 cured him and changed him utterly. ↑ "Valve boss Gabe Newell calls Windows 8 a 'catastrophe'". BBC. July 26, 2012. Retrieved August 28, 2014. 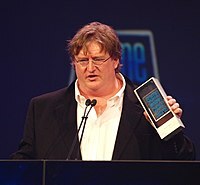 Wikimedia Commons has media related to Gabe Newell.